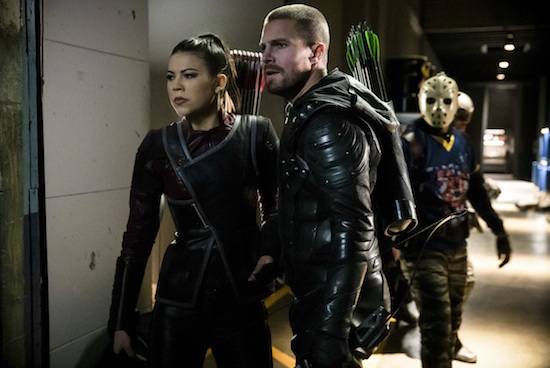 Arrow — “Inheritance” — Image Number: AR717a_0130b — Pictured (L-R): Sea Shimooka as Emiko Queen, Stephen Amell as Oliver Queen/Green Arrow and Rick Gonzalez as Rene Ramirez/Wild Dog — Photo: Jack Rowand/The CW — ÃÂ© 2019 The CW Network, LLC. All Rights Reserved. Let’s talk about Monday night’s TV! THE VOICE: Beth Griffith-Manley and Jej Vinson’s battle was the only one that really stood out to me in night one. But I was also pleasantly surprised by The Bundys, who could make things interesting as a trio going forward. AMERICAN IDOL: The vocal coach seemed extraordinarily cold? Good lord, Nate was sick and went to the hospital; it’s not like he was sleep deprived and just didn’t feel up to it. And then the judges making him sing the full 45 seconds when he clearly was having difficulty making it through it…what the heck? Yes, it’s a competition, but the round wasn’t over and that could have jeopardized his voice/the rest of Hollywood Week. It’s a different level of discomfort, but it combined with the grossness of how they treated Shay on Sunday night has really left me cold. I don’t know there’s a real answer for how to handle this, frankly. Hollywood Week has traditionally been one of the hardest rounds of the competition, mostly because it pushes so many people beyond their breaking point. There’s in-group drama, lack of sleep, people getting sick. Fine, you want that drama for television purposes. Fine. But when people are going to the hospital, when people have legitimate disabilities, maybe don’t be flat-out awful? ARROW: Being a Queen isn’t really great, but Emiko just feels like a child acting out. Okay, your dad was a jerk and screwed you over. OK. Maybe be your own freaking person versus swear allegiance to anyone, especially a bad dude? Just a thought. THE FIX: It being crystal clear that Ben was about to commit suicide did not make his actually killing himself any easier. But it was gratifying to see Maya unleashed. It’ll be interesting to see her now, as she fights to win this case with the gloves off. My guess for the killer remains the same as the first episode: Sevvy killed his wife, but one of his sons killed his girlfriend. Which shows did you watch last night?